Historically, food, water and shelter have been considered the basic necessities of survival, and the essentials that all animal shelters must supply cats for humane care. While this standard does provide for the physical well-being of cats, it doesn’t account for their emotional well-being. Even in homes, cats often lack appropriate outlets for expressing natural behavior, and the shelter environment is undoubtedly even more restrictive, since cats in shelters are confined to small spaces for long periods of time. As our understanding of cat behavior grows, it becomes compelling that we make a plan to provide for the emotional and mental health of cats, too, and that such a plan be considered a part of meeting the shelter cat’s basic needs. Even with the limitations that animal shelters pose, you can provide cats with avenues for expression of instinctive cat behavior by implementing a basic feline enrichment program. In this resource, we provide you with a primer on feline enrichment, including the reason that it is necessary, feline behavior basics that you should know, and a framework for how you can implement and grow a feline enrichment program in your shelter. Let’s get started. Enrichment, at its most basic level, is a means for meeting the emotional and mental health needs of animals in your care. There are a wide variety of tools and techniques you can use to enrich the experience for cats in your facility, and the good news is that many of them are not costly to implement. We’ll get into what the tools and techniques are and how to use them in greater detail, but for now, know that your primary goal will be to use them to target and reduce the stress of cats in your shelter. Cats do not express stress as openly as other species of animals. Because cats express stress in less overt ways, stress is called a “hidden killer” for cats in shelters. That sounds dramatic, but when you think about it, it’s a pretty accurate statement. A stressed cat is more likely to succumb to illness, especially upper respiratory infection (URI); more likely to exhibit behavior issues in the kennel, such as fractious behavior; and less likely to show social behaviors that lead to adoption. All of the side effects of stress put a shelter cat’s life at risk. Learning to identify and understand stress signals will be important so you can assess how the cats in your population are doing and target your enrichment before the fallout becomes fatal. We’ll teach you how to recognize stress signals in just a bit. It is worth taking a moment to stop and distinguish between an enrichment program and a behavior modification program. Enrichment is intended to allow cats to have a regular outlet for instinctive behaviors in the shelter, while behavior modification programs are aimed at directly working with cats to add desirable behaviors to their repertoire, or extinguish undesirable behaviors through the use of conditioning or training techniques. Oftentimes, implementing an enrichment program will have a positive impact on a cat’s behavior, and should be considered an essential foundation before shelter staff decides to go a step further and implement a behavior modification program. Behavior programs often require workers to have a set of specialist skills, while enrichment programs can typically be successful through the use of staff, volunteers, and a basic understanding of the goals and methods. Your existing staff and/or volunteers will be quite capable of implementing what you’ll learn here. By reducing stress and creating more confident, content cats in your shelter, you can improve a lot of things, from making workers’ jobs easier to having fewer cats in the facility. Need more convincing than that? Let’s look closer at some of the tangible benefits an enrichment program could bring to your facility. Easier, less stressful cleaning routines. When you add enrichment to your daily cleaning routine, you can make it a lot easier for both the staff members and volunteers who are cleaning, as well as for the cats who are typically stressed by the interaction. By creating a routine with a cat inside a kennel, you offer the cat a predictable series of events that make the cleaning much less scary, and possibly even rewarding. A great example of enrichment as part of the cleaning process is presenting food during the cleaning steps to create a positive association with cleaning for the cat. Cleaning can become something the cat looks forward to, because good things predictably happen during the process. Increased adoptions, decreased length of stay. A happy cat is one who is much more likely to get adopted. By creating and reinforcing confidence in your cats, you can get them to engage and interact more with potential adopters, increasing the chance that they will have a positive interaction that leads to an adoption, and in a more timely fashion, too. Improved health. Cats who have an enriched environment are much less likely to succumb to standard shelter ailments such as URI. Increased safety. By infusing enrichment into the way you perform routine procedures, you can greatly reduce negative interactions that may lead to a staff member or volunteer becoming injured. Cats who have their basic behavioral needs met are less likely to be reactive in the shelter environment. A good enrichment program should be species-specific and should promote natural behaviors for that type of animal. By targeting and enriching natural feline behaviors, you can diminish the effects of stress, boredom and anxiety in your shelter’s cats. But before you begin to work at increasing the quality of life for cats in your care, you should take a few moments to learn about the species you are working with. First, it is important to recognize that cats are predators. More specifically, cats are mesopredators, which means they are animals whose evolutionary instincts compel them to not only hunt animals smaller than themselves, but also to avoid much larger animals who may hunt them. Even with the silliest, most overweight declawed Persian cat, you still have an animal who, at his behavioral core, is driven by the instinct to acquire resources (prey/food, security) and avoid being the target of a larger predator. People don’t always realize how these instincts influence the behavior of the house cat, but they do. As predators, cats are intimately linked with their environment, often spending their entire lives in a specific piece of territory, whether it’s outdoors or indoors, and adapting their hunting/play and social habits to uniquely match what their territory/home provides. How does knowing this translate into shelter work? Simple: You must find ways to reward and fulfill the cat that are similar to the ways the cat might naturally be fulfilled in the wild, while simultaneously trying to minimize how often we humans (perceived predators) are presented as a threat to the cat. The nature of cats should also help indicate to us how important a part the environment plays in their overall levels of confidence and happiness. In addition to understanding the instincts that drive cat behavior, it is also essential to any successful enrichment program to learn about how stress affects behavior and how to identify stress signals in shelter cats. Cats’ bodies are exceptionally expressive, so analyzing feline body language can be one of the first tools you use to decode how stressed a cat is. Besides body posture, where the cat is located in the kennel, what her daily behaviors are, and how she interacts with the things in her cage can give additional clues about her emotional state. By observing how stressed a cat is, you can more accurately target enrichment for her. 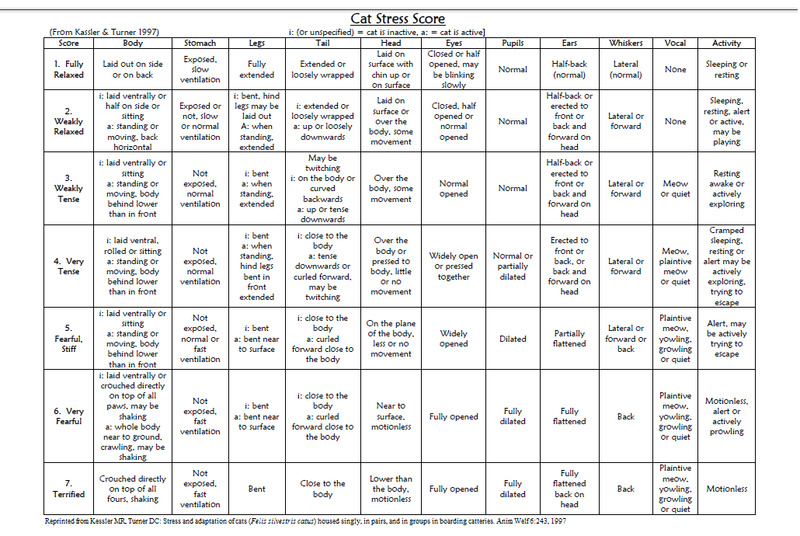 There is a scoring system that has been developed to assess stress levels in cats, and you may find it useful. The Kassler & Turner Stress Scale is a reasonable guide for grading levels of observable stress based on body language and position of the cat in her kennel. The scale has seven levels, ranging from “very relaxed” to “terrified,” with corresponding descriptions of body language to match at each level. Using this scale, it can be common to see contradictory body language between different levels on the chart, but by combining the scores and creating an average, you can have a relative score to calculate and record. Of course, this scale is not the only means of decoding the stress levels of shelter cats, but it can be useful in conjunction with other observations, and can be displayed publicly for staff and volunteers to examine and follow. We’ll provide more details on stress signals to watch for in the section below called “Behavior of Stressed Cats.” By combining use of the Kassler & Turner Stress Scale with observations by staff and volunteers throughout the day, you will have a system for assessing stress with relative accuracy. For a variety of reasons, it can be both informative and wise to monitor and record the stress levels of cats in enrichment programs. The most important reason is to help your workforce assess whether their enrichment efforts have been successful with an individual cat, or if current program routines may be causing more harm than good. Ideally, you should see a gradual reduction of stress levels in observed cats over the course of a successful enrichment program. If you do measure, it is ideal to take two measurements and compare them. The first measurement should be taken before starting an enrichment session, and the second should be taken after the session is complete. When you compare these measurements, they should indicate that the stress level of the targeted cat is the same or lower after the session. This aspect of monitoring can admittedly be time-consuming, but it can also be a reasonable tool for monitoring the success of the program and identifying when you need to modify your approach with a specific cat. When you have identified that a cat is persistently stressed, you should try to make interactions as minimally aversive as possible, while still providing the cat with opportunities to express natural behaviors. This could involve you setting up the stressed cat’s kennel in a particular way, or preparing it so that the cat has enriching experiences that occur at night, when people are not around, or that the cat can engage in at his own speed. Fearful, reactive or “feral” cats can still be included in an enrichment program, though the methods may have to be modified for safety or targeted success. In some cases, it is wise to work with a behavior specialist to come up with a more advanced plan for addressing the needs of these animals. One of the most valuable tips for reducing environmental stress is to have staff and volunteers focus on being slow and thoughtful as they work with or around cats. Workers should be encouraged to think about how their movements, sounds and smells could have a negative impact on the cat population. When workers are in a rush to meet deadlines or to keep up with the fast pace of the shelter environment (e.g., making frantic cleaning motions or hasty entrances or exits from the room), they often inadvertently create many stressors for the kenneled cats. Observe staff and volunteers doing some of their tasks and coach them on being able to recognize and reduce their own potentially negative actions. With the goal of making life better for the cats in your care, awareness of potential stressors and ways that you can alter your work habits to reduce stress is just one of many avenues of enrichment. Let’s examine other methods. It’s important to realize that what may work for one cat may be aversive for another. Maintaining success in an enrichment program requires frequent observation of each shelter cat’s responses to different techniques, and an ability and willingness to modify the enrichment plan for a cat if it is deemed to be ineffective. Switch out toys on a regular basis. Pick a new scent or “scent of the week” to add to the kennel. Play a varied soundtrack providing ambient noise at different times of the day. Offer novel or unique food items as a special treat. You can maintain routine in the cats’ day by keeping a predictable schedule, but within that schedule you can vary the types of toys offered, the scents provided or the sounds played to generate curiosity and excitement. When you offer cats a diverse environment, while ensuring that you are keeping their sense of security at the forefront, you simulate aspects of the changing yet stable environment that fits the natural hunting and opportunity-driven lifestyle of cats. Environmental enrichment can happen in two ways, by either adding something to the environment to enhance it or by removing something from the environment to create a more passive, less stressful environment. Think about the things that the cats interact with indirectly that you can improve. For example, you can remove objects in the room that obstruct a nearby window, giving the cats in your facility access to the view outside the window. Are there things the cats interact with directly that you can improve? For example, you can leave a cat’s unsoiled bedding in the kennel multiple days in a row so that she has a bed that smells familiar and retains her scent. Over time, you should develop an understanding of how the changes you create in the rooms of shelter cats can have positive or negative effects. Below are a few more examples of possible stress reducers or enhancers that can be adjusted in the cats’ environment. A good enrichment program will involve several of the above techniques. By addressing each sense of the cat, you can create an environment that promotes curiosity and mental stimulation while still giving a sense of security. The way that you house cats, from their location in the room to the types and arrangement of items in their kennel to their overall access to space, can all be tools of enrichment on their own. Recognizing how different aspects of your housing affects their stress and confidence levels can be an important tool for increasing the quality of life of the cats in your care. Location in the room. Cats put great value in being able to predict events in their environment. They also favor elevated positions, to help inform them of both threats and resources that may be moving through the area. By assigning cats to positions in the room based on their confidence level, you can help reduce the amount of time it takes for them to acclimate to their environment, or reduce the impact of stressors present in the room. For cats who are shy, reactive, fearful or aggressive, we recommend assigning them a kennel that is less exposed to the busy operations of the shelter, while also considering the ease with which the kennel may be accessed. You may decide, for instance, not to place a newly impounded cat who is showing signs of high stress in a kennel that is in the middle of a bank, on the bottom row, and provides a ton of visual stimulation. You might also avoid taking the same cat and putting him in a kennel that the workers must stand at an odd angle to access, or have tasks that require them to be working frequently above the cat’s head. Try to account for what things may cause the cat additional stress outside of the daily routine that happens inside the kennel, such as being next to a door that opens frequently or being in a kennel that overlooks a busy intersection. Different types of kennel placement can also be very rewarding for cats. Kennels that allow a view of the outdoors, or perhaps a lobby of guests, can be stimulating for confident or inquisitive cats. You can also arrange for certain things to be moved to or in front of kennel areas to either limit or increase the amount of visual stimulation. Occasionally, TVs with programs aimed at cats can be utilized to provide enriching sights for cats who do not have access to windows or areas of observation. Does the cat have a place to hide? Does the cat have areas to appropriately leave his scent? Does the cat have the option to get on an elevated surface inside the kennel? Does the cat have realistic resting areas? Are food and water areas spaced apart from litter box areas? Sometimes you may mistake a cat who is hidden as one who is fearful, when in reality the kennel offers no area that the cat can stretch out and options for where to rest are limited. Additionally, some cats can be stressed by having no place to get out of view of people (the public, shelter employees and volunteers). By arranging a kennel space that offers cats the option of both resting hidden and in plain sight, you give them a level of control and security. You must make sure that the setup of the kennel is not creating more obstacles for the cat, instead of providing reprieve and rest. The internet is full of inexpensive ideas for making hiding boxes or elevated surfaces to enhance the setup inside the kennel. The kennel layout should also be heavily considered and modified based on the available kennel space. If possible, cats should have a few feet between their litter box area and their food and water area. If space allows, you should also create an open area that allows the cat to stretch out, lets him walk from the front to the back of the cage, and provides a place where the cat can enjoy a variety of toys and play with them appropriately. Certain adjustments may need to be made based on the behavior and activity level of the cat. For instance, a cat who is constantly trying to solicit attention at the front of the cage, or a group of cats in a kennel bank who are regularly played with using wand toys, should probably not have water bowls or food bowls placed near the front of the cage, because you run the risk of the cat routinely knocking over these items, thus reducing the cleanliness and comfort of the cage. A shy or fearful cat may need a kennel that has a hiding area in the back, but still has a reasonably accessible walkway to the front of the kennel and an enrichment area near the front of the kennel. With a shy cat, you don’t want to make a refuge area that is easily disturbed each time the kennel door is opened, and you likewise don’t want to block the cat off from being able to leave her hiding spot as she grows in confidence. Almost any shelter setup can be improved by the appropriate use of toys. For cats, toys represent an outlet for a series of natural compulsions. Play helps cats express instincts that are meant to make them effective hunters, as well as helping to give them an outlet for energy that has no way to be expelled inside their kennel environment on its own. Successful “hunting” and play activities are also linked with increasing confidence. In addition, hunting/play behaviors are intimately tied into appetite for cats, and can promote a natural activity cycle. Distributing and maintaining toys in kennels can be one of the simplest ways of providing an enriching environment for cats, and one of the least time-consuming options for you to implement, too. Can the toy actually be used as intended with the space given? Is the toy stressful for the cat in any way? Is the toy sanitary, can it be sanitized, or is it easily disposable? Many well-meaning workers will deliver play items to cats, only to notice that they’re left exactly where they were originally placed in the kennel. It’s important to recognize that movement is one of the major triggers that leads to play in cats, and for some, self-play may be of little interest. Knowing that movement helps facilitate play, it can be a good strategy to select toys that create either movement with very little interaction, or that move on their own. Some examples are Cat Dancer–style toys, toys that attach to the door of a kennel and require only the slightest bump to create a lot of motion, or ball toys that roll easily around the kennel. Sanitizing toys should also be a priority for workers involved in the enrichment program. Different disinfectants can be used, but all should be researched to find out whether the disinfectant needs to be cleaned off, or if residue could be harmful or stressful to the animals that use them. A great alternative to regularly needing to disinfect different toys as they go between cats is to have toys that are assigned specifically to an individual cat. A common technique is to have a container, cubby or box for each cat that holds toys intended only for him or her. Toys should be regularly inspected to ensure that they have not become damaged in a way that is threatening to the cat’s health. Below are descriptions of the most common toy items used in the shelter environment. Often, these toys may be combined with food, which will be discussed further in the “Food as Enrichment” section. Small objects. Balls, furry mice and other small “swattable” toys mimic ground prey for cats. These toys are easy to distribute to cages regularly, and are typically easy to sanitize. The downside of these toys is that space is required for cats to fully enjoy them. If possible, create an area of the kennel space in which the cat can swat at the toy without the risk of knocking over food and water bowls. Most fuzzy and plush toys can be sanitized by putting them through the wash, or by using a disinfectant that can be used on carpeted surfaces, such as the product called Rescue (formerly called Accel). Toys with feathers. These kinds of toys may be especially exciting for some cats. Often, smaller toys that can be swatted will be accompanied by feathers. Small feathered toys mimic avian prey. Sanitizing these toys can be a challenge, however, and it is best to check them daily to ensure that they have not become ruined. Cats react differently to feathers, and you should attempt to observe cats in their first rounds of play with these toys to ensure that they are not ingesting pieces of the toy during their play. Toys attached to kennel bars. Different types of toys can be attached to kennel bars. These include toys that have a wire, such as the Cat Dancer, and other varieties of toys that could potentially be attached to the walls or bars of the kennel with a zip tie or suction cup. The appeal of these toys is that they are often elevated from the ground surface of the kennel, and the cat can interact with them even though there’s minimal floor space. These toys often double as self-interactive toys. Important note: It is critical to make sure that the attaching wires or straps of these toys are properly secured and do not pose a threat of entanglement for the confined cat. Toys should be regularly inspected to ensure that they have not become loosened or damaged. Disposable toys. Not all toys need to be reusable to be a valuable tool for enrichment. Disposable toys can be both satisfying for cats and easily available for shelter workers. Some common examples are pieces of paper crumpled into balls, disposable cups filled with smaller toys or food, toilet paper rolls or cardboard tubes, milk jug rings and cardboard toys. These toys can be gratifying for cats to destroy; many cats enjoy toys that change in texture or shape as they continue to play with them. These toys should typically be removed each day during cleaning. Interactive toys. Toys that move without the cat needing to initiate the interaction can be grouped as “interactive” toys, as they interact with the cat or the cat’s environment on their own. Most commonly, these are automated toys (either manually charged or charged with batteries) that can fit inside a kennel. Some other effective interactive toys are ones that maintain perpetual motion, such as “fidget spinners,” where a slight bump can cause the toy to stay in motion for several minutes. These types of toys are especially valuable for cats who are not motivated to start play with stationary toys. Note: Any toy with moving parts should be inspected daily to ensure that it has not become damaged or that small parts have not become loosened, presenting a choking hazard to a cat. Toys that require interaction between the cat and a human. The most stimulating play typically comes from these types of toys. By being in direct control of the toy, you give “life” to what would otherwise be a stationary object. The most common examples of these toys are wand toys, in which objects such as feathers or fuzzy toys are attached to a stick. The goal of the human in these interactions is to move the toy in a way that mimics an animal likely to be prey for a cat, trying to illicit a playful or predatory response from the cat. Those seeking to play with cats with interactive toys should be mindful of their movements, making sure not to move the wand in a way that is intimidating to the cat. People often make the mistake of thrusting the toy into the cat’s face repeatedly, in a “fencing” manner, and it ends up startling or stressing the cat. It’s best to use wide, sweeping motions that change direction often, rather than moving the toy frantically. Note: Toys like wands can be used to stimulate multiple cats at once outside the kennel, or be used individually, dangled directly in the cat’s kennel. It is important to keep sanitation in mind, as these toys can spread germs to other cats if used haphazardly. Unsafe toys. Certain toys pose too much of a safety risk to be included in an enrichment program. These toys include string or yarn, laser lights or pointers, and toys with small beads. While string is a favorite toy of many cats around the world, it poses a risk of entanglement, strangulation or even death if ingested. String toys can be used to play with cats, but they should never be left with the cat in the kennel. Lasers are another popular toy for house cats, but they also pose certain risks. Lasers can do serious damage to cats’ sensitive eyes and should be avoided in the shelter environment. Additionally, many kennel walls and floors are somewhat reflective, and can lead to an accidental reflection into the eyes of a cat. Lasers can also create frustration in kenneled cats, since they lack the ability to actually “capture” the laser dot, making them unable to fulfill the natural order of events (stalk, capture, kill) in hunting. Other toys, such as ones that contain small plastic beads, have pieces of foreign material that cats can ingest, which can lead to serious medical issues. It is often safest to avoid giving cats these toys. Finally, a note about catnip: Catnip can be an effective way of creating more stimulation and interest during enrichment activities. Not all cats will respond to catnip; about two-thirds of them should have a reaction. Some cats using catnip can be prone to overstimulation, so catnip use should be monitored with care. A common technique is to create a catnip “humidor” that holds a small amount of catnip and several clean toys. The concept is that the catnip will cling lightly to or enhance the toys in the container without being overwhelming. Like other enrichment items, catnip humidors should be regularly disinfected. We briefly mentioned pairing food with toys above, but because all animals have a basic set of needs that includes food, and cats are no different, it can be a particularly powerful enrichment tool that warrants more discussion. How a living thing acquires food is one of the driving factors behind both learned and innate behaviors. For wild cats, that acquisition is typically achieved through hunting, but even house cats have the same instinct for procuring food. By linking play, overall activity and food, you can enrich cats in the shelter and give them challenges to simulate natural behavior. By stimulating seeking behavior, you can provide mental exercise to combat the effects of shelter cats’ sedentary or stressful lifestyle. Common food items used for enrichment include dry treats (Temptations, Friskies, etc. ), dry kibble, wet food and packaged tuna or deli meat. Treats that are given out daily can be a form of enrichment all on their own. While not very stimulating cognitively for cats, the occurrence of workers and guests regularly leaving valuable treats in kennels throughout the day is a great way of promoting social and “front of kennel” behaviors. Presenting food treats during stressful times can also be a tool to help create positive associations with actions that might otherwise be stress-inducing for cats. A great example of using food to lessen the overall stress of an activity is presenting food treats during the kennel cleaning process. It may be ideal to present a high-value food, such as wet food, during the kennel cleaning routine to distract the cat from fixating on the worker’s actions and building bad associations. For example, you might present a small tray of wet food to a cat as you begin to remove the cat’s litter box to replenish or replace it, thus distracting the cat from your actions and adding a layer of positive conditioning to the overall experience. To aid in determining what types of food items may be effective for certain cats, we recommend trying a “test run” by placing some treats in each kennel, leaving the room, and coming back in 15 minutes to see who has eaten their treat. This can be a way of identifying cats who are especially food-motivated, and it may also be a trial-and-error tool to figure out which treats offer no reward value for certain cats. Taste is subjective, and the individual cat decides if a treat or other food item is rewarding. Mixing play behaviors, toys and food together can be one of the most powerful avenues for enriching cats in shelters. Toys that challenge cats to figure out a problem that in the end results in a food reward keep their brains thinking, and help reduce the effects of a repetitive, stagnant shelter lifestyle. These types of activities can be either human-interactive or self-managed. Depending on the complexity, some food toys or puzzles may only need a few moments of maintenance (to refill or reset them) throughout the day. Other games and toys may be best when a human agent is monitoring them, to either help reset as the event unfolds or to add an interactive level of difficulty to the event to add further layers of cognitive enrichment. These games are best for cats who are noted to be especially curious, active or even bored in their kennel. A level of variety should be included in these “thinking” enriching activities. It should be the goal of the enricher to provide activities and toys that require the cat to invent new solutions to problems, to avoid having any one activity become too predictable for the cat. In all food-related games, it is worth making sure, as mentioned previously, that the specific cats engaged actually have an affinity for the treats being used by offering them some beforehand and observing their reactions. Feeding toys such as Kongs, wobblers or other objects that challenge cats to manipulate them to gain access to food can be one of the easiest types of enrichment to maintain. Some cats may even enjoy their feeder toys so much that you might consider providing one or more of their regular meals in these objects. For most wild cats, eating does not come without work, and feeding toys in the shelter environment can mimic this instinctual notion by allowing them to work for their food. The following are some sample games and puzzles that can be implemented in most any shelter and with minimal resources. The methods and materials can be changed to suit what is available. As with toys, there should always be constant consideration about the materials used and their ability to be sanitized or disposed of to prevent a build-up of bacteria or disease transmission between cats. Treat hide-and-seek. The goal of this game is simple: Hide a treat and challenge the cat to find it. This game can be as easy or as complex as you like, but if the game is too complex, it will not offer much enrichment to the cat in the session. Here’s an easy example of this type of game: Present the cat with a valued food item, let the cat examine the treat, drop the treat into a small paper cup with an opening smaller than the diameter of the cat’s head. The cat must now find a way to get the treat out of the cup, which typically is either reaching in and grabbing it with a paw or knocking the cup over to get the treat. To increase the challenge level, you can try hiding a food item underneath a cup placed face down. This game can be further expanded by presenting a series of small cups face down, with only one or two of them having food treats beneath them. This concept can be re-applied in dozens of different ways using a variety of objects. You can also use disposable items such as paper towel rolls or crumpled paper for a variation on this activity. Fetch or chase. A very simple activity is to present the cat with a treat he enjoys, and toss it in another direction. Because the throwing movement may be startling to some cats, we recommend starting with a gentle toss and escalating to a throw as the cat becomes used to the activity. This is a great way for cats to pursue an object that also ends up being a food item, somewhat mimicking the pursuit and capture of a prey animal in the wild. To add another layer of depth to the pursuit and reward of the activity, try rolling or tossing a feeder toy that’s in the shape of a ball. Another strategy that can be interactive is to use a long wand with a flat surface on the end (such as a telescoping back scratcher) to hold an amount of sticky food, and move the wand in a playful manner on the ground to encourage the cat to chase it and receive the reward. Note: It is wise to avoid encouraging cats to chase or target your hands in order to capture a treat. Instead, use a tool to prevent the cat from associating hands with play objects, which can lead to scratches and bites. Mystery or puzzle box. Another simple game that can be applied in many variations is to create a box or container with several holes on the box top, large enough for a paw or toy to fit in. Load the box with several treats, toys or novel smells for the cat. The length, depth and width of the box should be suited to the housing area of the cat. (Some suggested dimensions are 2 inches deep, with sides 4 by 8 inches.) It is best to have the contents of the puzzle box be a mystery for the cat, letting each time she forages be a new and varied experience. Some cats may need to see objects placed into the box, while others may instinctively want to explore the holes to see what’s inside. To enhance the experience, create several chambers inside the box using trimmed toilet paper rolls or cardboard dividers, and put something different in each chamber. Placing an interesting toy (e.g., a fuzzy mouse) in partial view in the bottom of the hole may also lead to an entertaining game while the cat tries to figure out how to get the toy out of the box. In addition to the low-cost, often disposable puzzles detailed above, a variety of re-usable puzzle games and feeders are available in the retail market. One of the appeals of retail puzzle games is that they are typically easy to clean and maintain, they often have the ability to add or decrease difficulty, and they are usually tested in a large census of cats before being put on the market. A strategy for acquiring them on a minimal budget is to place some of these toys and games on a public wish list for your shelter and seek donations. While cats are typically typecast as loners or solitary creatures, they are, in fact, social animals, so having human contact is another form of enrichment for most cats in shelters. Having meaningful interactions with the cats through petting, brushing and proximity to people can greatly improve the quality of their stay in a shelter. Spending a set amount of time with different cats and encouraging them to be social, or comforting them through touch, can be rewarding to both the human handler and the cat. It is critical, however, to ensure that you are not overstimulating the cats in these interactions. The shelter workers or volunteers who will be involved in holding, petting and grooming the cats should be trained to be aware of cat body language and signs of stress, so that each interaction ends on a positive note. In addition, workers should use hand sanitation practices before handling another cat. For some cats, forms of enrichment such as play and food games are not so motivating, and human interaction may be their preferred type of enrichment. You should explore what specific types of handling each cat favors. This could mean taking time to brush, pet or even simply talk to the cat in lieu of providing toys. Whatever interactions the cat responds to favorably should be integrated into the cat’s enrichment program. It is especially important for kittens and juvenile cats to engage in social interaction as a part of their enrichment plan and in order to facilitate their cognitive development. Young cats should have the opportunity to experience petting and loose handling to provide them with skills they will use to interact with humans in the future. Providing these cats with pleasurable handling experiences will establish a positive association with human handling, and will help to reduce the chance that the frightening experiences of the shelter will have a lasting negative impact. Can the cat be handled easily? Is the cat able to be picked up? Is the room the cat will roam in secure? Does the room have areas that may create difficulties in recovering the cat? Are there other cats in this area? If so, are they kenneled or roaming? Has this cat been observed around other cats? Will the cat have to be transported to the room? If so, does the cat tolerate transport well? If the stress of capturing or retrieving the cat at the end of the session is significant, it can have the opposite effect of enrichment. If there are negative answers to some of the above questions, it does not necessarily mean the cat in question should not be a candidate for time outside of his kennel. Rather, it should indicate that plans and accommodations need to be in place before allowing this cat to enjoy this activity. It is advisable to start with having only one cat out at a time in an area for enrichment, to reduce the chance that the experience becomes complicated by the interactions between two cats who may not be compatible. At a later point, when you are able to accurately decode the cats’ body language, “play groups” can potentially be created by pairing cats who have displayed social behaviors with other cats. The goals for out-of-kennel time may be varied, and designed independently for different cats based on their needs. For some cats, exercise will be the primary goal. Free from her cage, a cat can chase, run, pounce and perform actions she may otherwise be restrained from doing in a small kennel. This can also be a time to use automated environmental enrichment tools, such as bubble machines or toys with battery-powered movement. For cats who are feeling less athletic, this may be a time to use social enrichment, allowing them to climb on your lap, for example, or lie in a pleasing, soft bed for some additional grooming. Whatever you use out-of-kennel time for, you must make sure that the cat is supervised initially. In a cat’s first few ventures out of the cage, you need to keep an eye on him, and possibly control the amount of environmental stimulation he receives, to reduce the risk of having an episode that becomes startling or aversive to the cat. After some time, confident cats may be given special allowances to be unobserved in their free time, but this should only be allowed after some assessment of how they have done in the space. At all times, be attentive to sudden changes in the cat’s body language, and be prepared to distract the cat or intervene when stressors present themselves, to ensure that the activity remains enriching. With so many types of enrichment available, there’s something you can offer virtually every cat. A good enrichment program will provide outlets and engage all cats in a given shelter environment, regardless of the reasons that they are at the shelter. Typically, shelters have some cats who are quarantined or isolated for medical, behavioral or other reasons. All cats, even quarantined ones, should have plans created for them to enrich their lives and reduce the stress of being confined and exposed to shelter life. It may not be realistic for you to directly engage some of these animals, so special enrichment plans may need to be created. Below, we offer a series of suggestions for enrichment in these more challenging scenarios. Cats in quarantine or isolation are likely there for a good reason. Typically, these cats are recovering from injury, battling infection, or serving a court-ordered or legislative hold. While these cats may not be able to experience the full range of the enrichment concepts discussed above, several facets may be selected and applied to these cats individually. Enrichment can be especially valuable to cats who are recovering from infectious diseases, such as URI. It can combat boredom and depression, and aid in the cats’ recovery as you lessen their stress. The first goal in interacting with these cats for enrichment activities should be a paramount focus on preventing the spread of germs to other animals. To reduce the risk of spreading germs, you should be appropriately gloved, gowned or prepared in whatever way is standard protocol for sick animals in your shelter environment. The next step should be to devise a plan to isolate, mark, or otherwise contain and label toys or enrichment items for each cat, rather than allowing several cats in isolation areas to share items. Toys for quarantined cats exhibiting symptoms of infectious disease should be limited to ones that can be completely sanitized or can be thrown away. It is not uncommon for sick cats to be less responsive to play. You may need to spend additional time engaging these animals to have a meaningful experience; do not rush when attempting to get these cats to engage in play or other activities. Cats who are congested or who have their sensory ability diminished, as in the case of URI, may respond well to auditory and visual cues while ignoring or being unable to respond to olfactory (scent) cues. By stimulating these cats and getting them to actively play, socialize or even eat, you increase the likelihood of a speedy recovery as you reduce the stress load on the animal. For cats on a “bite hold” or other legal quarantine, enrichment is still a viable option. These cats frequently have an additional level of stress, since they are temporarily isolated from whatever measures of security they had in their previous environment, so the need for stress reduction is ever-present. You are advised to consult your local legal specialist, your local department of health, and/or your veterinarian for guidelines on how you may legally interact with these animals. After learning your legal limitations, you can assess each cat by first analyzing stress, observing interactions with initial enrichment items offered and then planning from that point. Even if you cannot have direct contact with the cat, you can, at a minimum, provide indirect environmental enrichment or access to self-interactive enrichment toys. It is common to have several cats in a shelter environment who are described as shy or fearful, or even fractious or feral. As mentioned previously, any enrichment program that is successful should include all cats in the population. Creating an enriching environment for these animals can seem intimidating, but there are many effective techniques that can be used to provide a more positive experience for them. In many cases, these animals would best benefit from the attention of a trained behavior specialist; however, access to a specialist should not bar them from receiving enrichment of some type. Working with these cats may require the use of a long tool, such as a wand, scratcher or telescoping instrument, to allow you to have contact but disrupt the association between you, the human (who the cat may see as a predator), and the enriching toy or food item you are offering. Additional safety precautions may also be necessary because of the potentially fractious nature of cats in this category. Below are some additional tips for working with hard-to-handle or reactive animals. Providing refuge. It is ideal for every cat to have a refuge area to hide from the stress of the shelter environment, but for shy and fearful cats, this is a must. Plastic commercial feral boxes are ideal for these types of cats, but if your shelter doesn’t have access to these boxes, you can create effective hiding areas out of cardboard boxes or small carriers. How much visual stimulation the box offers should be carefully considered. Oftentimes, you can control visual stimulation by keeping the clear front of the feral box facing toward the back of the kennel, or you can aim the clear area to the front and cover it with a blanket so that the cover can be slid back and forth, modifying the visual stimulation. Another option is to control visual stimulation by placing a blanket over the front of the kennel, and likewise control how much visibility the cat has. Some cats may need to be completely hidden at first, and then slowly exposed to more visual stimulation as their confidence or familiarity grows. Understanding distance and approach. The first thing you should recognize with fearful, reactive or feral cats is that staff and volunteers are often perceived as a threat by the cat. By knowing how distance can affect a cat’s behaviors, you can gain an additional level of control when working with these cats. Try to be thoughtful in the way you approach the kennel; be sensitive to how your approach might be increasing the stress level of the cat. By using a soft, patient and indirect approach to the kennel, you will have a less threatening presence, and may not be perceived as predatory or aggressive by the cat. It can be advantageous to approach the cat’s kennel at a diagonal or lateral angle, rather than head-on. By using tools such as a telescoping back scratcher or wand, you can distance yourself physically from the cat while still being able to interact with him. When using such a tool, you should be mindful that the tool is not equally or more threatening to the cat compared to an approach with a hand. Long tools are sometimes ignored by stressed cats or, in other cases, are not perceived to be an immediate threat, and are therefore useful. With these tools, you can often perform some of the standard enrichment activities described above, observing and documenting the effects. An example is presenting a toy or food item via the long tool, or even giving a gentle caress to the side of the face or top of the head with a long-handled back scratcher. Identifying a cat’s threshold. In this instance, we will define “threshold” as the point at which events begin to produce a negative, stressful reaction from the cat. In a simple scenario, you might imagine this as the distance from the cat at which the cat first begins to show signs of stress as you approach to interact. For instance, the cat in question is indifferent toward you as you approach, until you come within three feet of him, at which point he hisses (that’s his threshold). Here’s another example: Inside a cat’s kennel, you are engaging the cat in a play session with a wand. After a few moments of play, you notice the cat’s ears begin to flatten and his tail begins to twitch; this cat has reached his threshold. In the first example, the threshold is represented by distance, and in the second, by time exposed to a certain activity. By identifying a cat’s threshold, you can help create an individual enrichment plan that does not violate this secure boundary. After identifying a cat’s threshold, the goal is to ensure that interactions of any sort stop just short of going beyond the threshold. The hope is to eventually condition the cat to become more tolerant of your presence, allowing you to work more closely with him. You can think of it as a line in the sand that you do not want to cross, but with repetition and consistency, you hope to move the line closer and closer to the cat. You might think of a cat’s threshold as an expression of where the cat’s confidence level is. Use the distance or time indicator as a measuring point, and then strive to decrease the distance by leaving treats or toys at the border of the threshold, or increase the time by extinguishing a play session before the contact becomes unwelcome. Allowing ample resting time. It is common for shy, fearful or feral cats to be stagnant and stressed while humans seek to interact. You should not pressure these cats into responding. Rather, you should allow them plenty of space and ample resting time. It may be that a cat in this scenario responds well to eating treats, but she may not be confident enough to eat them in your presence. It can be a good idea to regularly deposit treats or toys in the cats’ kennels, and then leave the room for a small amount of time to allow the kenneled cats to forage for their treats or toys without fear. By routinely maintaining this approach, you can build continued positive associations with the area of the kennel where the food rewards are left, as well as build a similar positive connection with the auditory cues associated with the process (the sound of the door opening, the sound of you taking treats from the container, and the sound of your approach to deliver the reward). Because fearful cats tend to be unresponsive when people are around, you should provide them with extra opportunities to explore rewards by leaving them regularly and repeating the scenario multiple times a day. It is ideal for each cat in the shelter to receive a minimum of 15 minutes of enriching interaction each day. Kittens and juvenile cats should have twice this amount, when available. Time spent having human interaction, playing, engaging in games, being out of the kennel and more can be considered for this sum total. What should not be counted toward daily enrichment is time spent cleaning kennels, as this activity is often aversive to cats or, at the very least, is not typically rewarding for them. In “Managing an Enrichment Program” (below), we’ll talk about what to do if it is impractical for your shelter to meet the ideal minimum. The time of day that enrichment is offered is also a consideration. Times that are busy or stressful for workers are not likely to be a good time to have them focus on enrichment activities. Workers should ideally have set times during the day to engage in enriching activities, as well as sporadic check-ins, and they should have the flexibility to change plans for specific cats. Having enrichment happen at consistent times of the day can be a means of creating a predictable environment for shelter cats. It may also be used as a tool to get cats ready to “show off” before meeting adopters. Cats spend most of their day at rest or in preparation for a new event, so you should also strive to ensure that their need for inactivity is met. Providing an hour of “quiet time” is a great tool for allowing cats to decompress in between enrichment periods, cleaning or viewing by adopters. By shutting off the lights in a kennel area, you can try to create a “window of rest” for cats during which they are able to sleep, eat or interact with toys without the fear of needing to interact. All programs should attempt to incorporate this window into the daily activities. How many cats are in our shelter kennels on average? What type of manpower can be contributed to an enrichment program? You are encouraged to determine the average number of cats who are regularly present in your shelter, and create a program around servicing this population size on a regular basis. The next step is to determine how many manpower hours it would take to provide that ideal 15 minutes of enrichment for each cat, and compare that to the number of manpower hours consistently available. Remember that manpower can come from paid staff as well as a volunteer workforce. For shelters that have incongruent numbers when making the comparison, there are several things to think about. The first is to consider how volunteers could absorb some of the duties created by an enrichment program, and whether those avenues can be maintained to provide a level of consistency. Another tactic to reconcile the relationship between hours available and hours needed is to modify the duration of the enrichment sessions. Reducing the number of minutes per cat is less than ideal, but it may be necessary for some shelters to create programs that can be sustained over time. Shelters should strive to not let this number be reduced to less than five minutes. You can also supplement with more self-directed activities to get more enrichment even with a lean workforce. In the end, it is better to do something enriching for each cat rather than nothing at all. After identifying how many cats are usually in care and how much time will be required for enrichment, two additional components are needed to manage the enrichment program. The first is to identify a staff member or volunteer who can be the program manager. This individual’s duties should involve monitoring the program for success as wells as areas for adjustment and improvement, creating individual enrichment plans when necessary, and managing the quality of enrichment services being rendered. This program manager should be able to demonstrate good judgment, an ability to lead others and an understanding of enrichment subject matter. The second important piece is to organize training for staff and volunteers who will be participating in the program. Training will help create buy-in from staff and volunteers, build confidence in your workforce and hopefully create more consistency in your program.